We only have to wait a little over a month before the first trailer for The Amazing Spider-Man 2 arrives with The Hobbit: The Desolation of Smaug in December. So far, we've only seen footage from the Electro-themed teaser that hyped the panel at Comic-Con earlier this summer. We've seen some cool photos from the film, and now three more photos have surfaced from The Times of India. 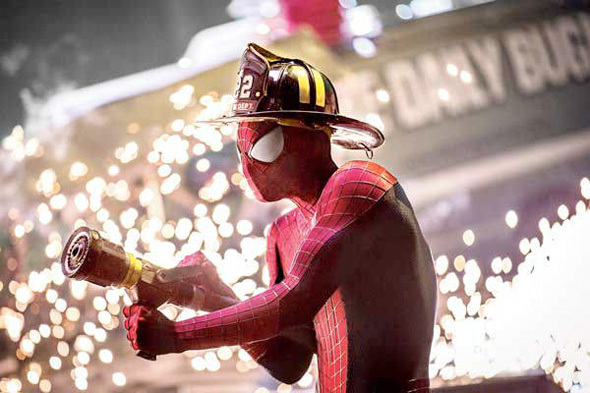 For some reason, this outlet has an exclusive on these photos that feature Peter Parker and Gwen Stacy (Andrew Garfield and Emma Stone) sharing a tender moments, Spider-Man firefighting, and a super pissed off Electro (Jamie Foxx). Is it the movie in which Gwen Stacy dies? 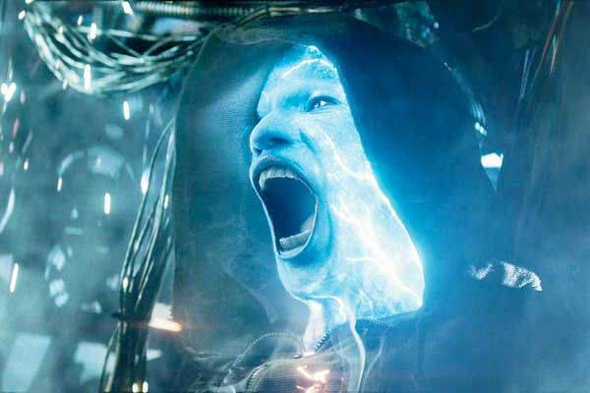 Every picture I see of Electro jut looks dumb. Is that supposed to subtly promote the "firefighter action" Spider-man figure? Hold on I will fight you in a sec...first let me show you this sic 1080 I can do on my board!